This set of high-end video headphones with dual HD display delivers a compelling mobile wearable video and gaming experience. As an on-the-go home theater device, iWear projects a 130 inch screen in front of the wearer. Content truly comes to life whether it’s from a computer, DVD player or gaming console. The headphones support 2D & 3D video, as well as virtual reality for a comprehensive range of options. 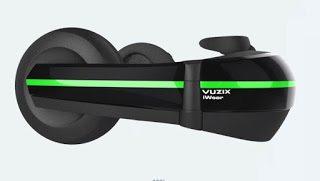 Vuzix’s model is much more lightweight than many VR headsets on the market.